Ecologists study how interactions between species affect populations. Trophic (feeding) interactions are the most obvious (e.g., lions eat zebras), but competition and mutualism are also important in structuring populations residing together. Food webs consider how seemingly non-interacting populations of species may influence each other indirectly, often through the actions of other species. How individuals interact with one another is behavior rather than population biology. Again, some behavioral interactions between species have clear population-level ramifications (e.g., predator-prey), but outside of these well-understood interactions, how do animals behave toward one another? We might expect that they would ignore each other, but what follows is a peculiar example of a direct interaction with an unclear motivation. Monsoon weather pushes up lots of vegetation in the desert grasslands of Arizona. 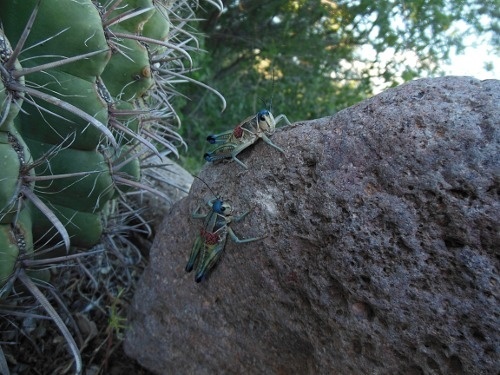 Insects respond in kind, and few groups increase in biomass as much as grasshoppers. With their succession of larval instars, their variety of form and color is staggering. The plains lubber is one such colorful, almost gaudy, critter: hues of red and blue adorn this stout insect that reaches over two inches in length. And while they eat their share of vegetation, they also consume other insects and even carrion. On the morning of 17 September 2013, I tracked down our female black-tailed rattlesnake, Persephone. She had left the shady, humid riparian corridor and I spotted her in the low branches of a shrub on a prickly-pear cactus covered slope. Having rarely seen her on the move, I decided to film her as she meandered about. She paused after seeing me, but in a minute she was on her way again. I noticed a plains lubber on her back behind her head, and I thought it was an accident and it would soon hop away after realizing it was on another creature. After leaving the shrub, Persephone entered another bush, and then paused thoughtfully before climbing into pencil cholla. The lubber held tight, moving to one side or the other to avoid being scraped off on a branch. Persephone continued to weave through the vegetation, finding tight gaps in prickly pear in an apparent attempt to shake her rider. For a moment she stopped moving, doubling back on herself. In her repose, the lubber appeared to get a little anxious, holding tightly to her skin but kicking alternately with hind legs – spurring her! Yes, in apparent deliberate annoyance, the lubber provoked Persephone onward, through more prickly pear and even rolling side to side to scrape her rider from his mount. My scraping was forceful, but Persephone remained still, tolerating it as if she knew her problem was being addressed like some cleaner fish of the desert. After several failed attempts, I circled around the brush into view of Persephone who then became upset with me. As she coiled and rattled I thought, “now I’ve done it, I’ve upset the snake and I can’t even get rid of this darn bug!” With renewed resolve and a better angle, I was able to get the lubber to the dirt and then flick him out into the open where I grabbed and relocated him. Hot and thirsty I retreated, hoping Persephone felt relief in spite of my intervention.